If you think like me, you would agree that the premise of the Planet of the Apes movies hinged on a pretty big plot device that allowed the humans to be overrun by apes. 2011’s Rise of the Planet of the Apes offered up an explanation that was a little bit more believable: the human race being attacked by a virulent disease. With a new Planet of the Apes on the horizon, the popular infection-based strategy game Plague Inc. has cashed in on the hype with its latest update, which allows you to soften up the world so the apes can take over. 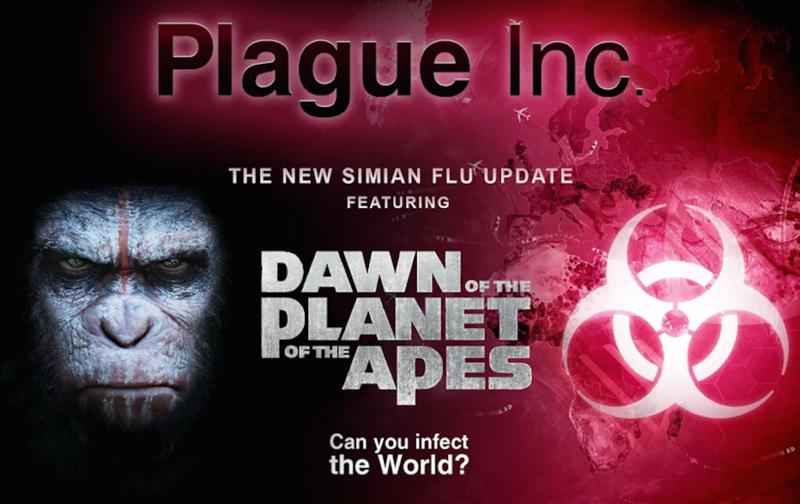 Plague Inc. already had a fairly robust strategic element to it, but in today’s update, the game adds a new Simian Flu expansion which allows you to play the events between 2011’s movie and the one that opens in theaters this week. The expansion will set you back about $2.12 after an in-app purchase. The Simian Flu can now be spread around the world as you would normally in a Plague Inc. game, but there are some new additions as well. Now, instead of having birds, rats and other animals carry your disease, you can select apes as well, since they are taking over the world. You can take on new mutations that allow ape-to-ape transmission or increase their cognitive function to help fuel the spread of disease. All of these actions line up with the story line that the new Planet of the Apes movie is running with, so if you enjoy the movies, this would definitely be something to look into. The game is free to download, but supported with in-app purchases.